It may not feel like it but April is here already and there is so much to do! There are two more trips to PAWS to report. On 3/29 we sent 13 cats, all ferals, of which 7 were males and 6 were females. Three of the ferals were being relocated thru the TreeHouse Cats At Work program. They were from a very inhospitable trailer park and very feral – they will do well. Carl is a feral that clearly wants to be friendly, he went to a foster and here are his pictures. He doesn’t look happy in the one photo but sure is lovin’ the petting. He is likely going to ADOPT for adoption. He’s FIV+, they do a wonderful job of finding just the right home for the FIV+ cats. On 4/5 we sent 9 cats, of which 7 were ferals and two were friendlies, comprised of 6 females and 3 males. Again, three of the ferals are destined to participate in the TreeHouse CAW program. They couldn’t go back due to negative human neighbors and there were no other colonies to our knowledge for almost 2 miles around them for them to relocate themselves to. Of the two friendlies, the female had been inside for 2years and was finally getting spayed – a broken canine tooth was discovered during her exam and she will get that taken care of now that it has been discovered. 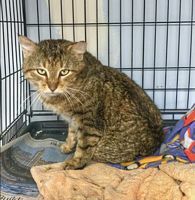 The other friendly was a male that had been coming to the caretaker sporadically for a year and a half – Rudy will also go to ADOPT for adoption. With these two trips, our March total is 50 and the start to April is 9, bringing our year total to 89 and our total since our beginning to 10,406. Many thanks to Charli and Dedra for transporting! Speaking of lots to do – we’re getting ready for the Kitten Shower. Working on baskets and items for our Silent Auction and door prizes, as always there are unique items for your bidding pleasure! Watch our facebook as we will be posting some of our Silent Auction items as we get them ready. Planning on lots of great food – lighter fare, lots of salads and deserts will be there. Come join us and spend time with fellow cat lovers – pre-registration by mail or online is $10 and $15 at the door on the day. Limited number of gift bags will be given away (still working on them!) with lots of cat goodies. Learn about fostering and all the opportunities available to help Feral Fixers move forward. Come have a great time! This is the first year we are participating in the DuPage Human Race. We have 6 participants and have raised $150 of our $500 goal. Please help motivate our runner/walkers and raise funds for Feral Fixers. I just made a donation of $60 – anyone willing to match me? That’s $10 for each participant – wish it could be more! The Race is in three short weeks – lets make our first year memorable!!! For more information, please click here. The search goes on. Who knew that finding a 3,000 sq ft, $300,000 building with 10+ parking spaces in Lombard or Villa Park – ish would be a lot of hard work? We’ve looked at a bunch of buildings and have learned a lot. We even found a ready-to-assemble building that would fit our needs if we get the right piece of land – so far land is really expensive! Please let us know if you have the right answer for us! We don’t have an active fundraiser right now but you can always make a donation to “Fund Our Ferals Future” anytime you would like. Thank you to all our donors who enabled us to surpass our goals for our recent Giving Grid fundraiser!!! Our adoptions have been wonderful. There are cats that we have had in foster for over a year that are finding their forever homes! BUT, we still have many adults who are hoping to find a home before kittens arrive and push them out of the limelight! Many of them are deemed shy – translate that to being very selective in whom they bestow their affections upon! These are cats that would not do well in a typical shelter, much too busy, noisy for their tastes, they are letting us know up front that they know what they need, no false advertising here. Think about it, do you want an “in-your-face” type cat for the next decade or more? Do you want a companion that will share your space, give you space and be happy as can be doing so? Not all cats were meant to burrow under the covers and pop up in full purr and lick your nose at 6AM. We have those too, and we have had several cats returned for being too active and outgoing. Please give it some thought and consider our quiet adults who need a home just like yours to share with you!